Bed And Breakfast830 sq. ft.
Set of 500 meters from J D Park Metro the Ethnic Bengali themed home stay is located at Hazra Road in Kolkata. Accommodation is attractively located and tucked conveniently in South Kolkata. It is in the heart of the city but nestled in a quiet neighborhood and well connected by various modes of transport. The rooms are well appointed with round the clock security and with amenities that suite single travelers to families who come to Kolkata for tourism, business, or social engagements. Birla Planetarium is 19 minute walk from the accommodation and 15 minute walk to Kalighat temple – the origin of the city. Victoria Memorial is 2.2 km from the home stay while new market is 3.9 km away. Home stay is located 3.7 km away from Indian Museum and within 2km away from the other cultural hub. A wide variety of food options and places of interest are available through a large network of travel option, including those who wish to walk down Kolkata’s memory lanes. The nearest airport is Netaji Subhas Chandra Bose International Airport 17km from the accommodation. Railway station is Howrah12km from the home stay. Oh! It’s a Home at Kolkata. Kolkata, or Kalikata as Bengali's say, gets its name from Kalikshetra meaning “The land of Goddess Kali.” Well, we at Mandira’s Home Stay are just a stone throw from this iconic temple in the city which is a must visit for all who come here, and it is at this temple Goddess Kali resides in a grand glory. 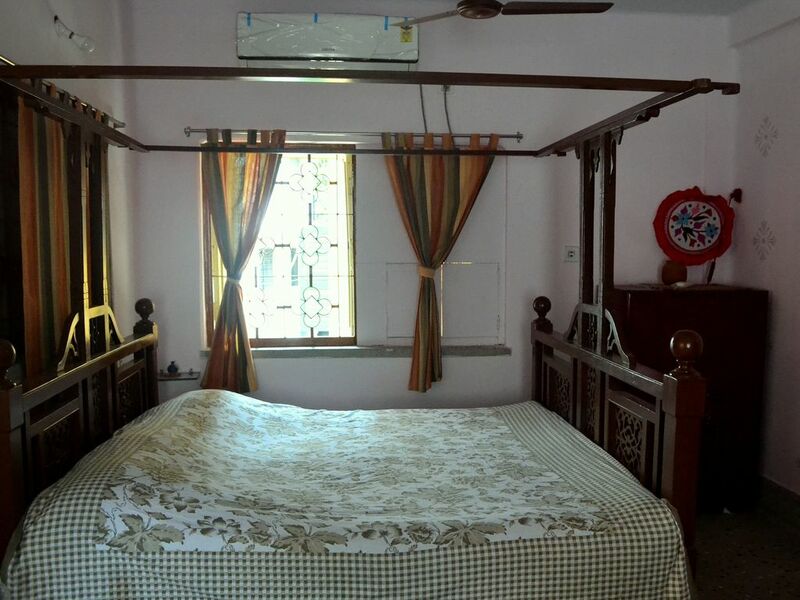 It is Mandira’s Home and staying here you can enjoy the comfort of a traditional Bengali Home in a heart of the city but nestled in a quiet comfortable neighborhood. There are two well appointed rooms’ one very large double room and a small comfortable single room, with round the clock security with amenities for solo travelers. All units comprise a dining area, a fully equipped kitchenette with various cooking facilities including microwave, toaster, induction oven, electric kettle and blender. All rooms boast a flat screen TV with cable channels and a private bathroom Flat screen TV with cable channels and air-conditioning are provided in each unit. We are offering free Wi-Fi, throughout the property. Breakfast is typical Bengali style and comes with a local desert and has a choice of eggs preparations. Tea or coffee is as per choice! We can serve you lunch, dinner or an evening munch if you wish. They carry a nominal charge for home cooked food. Please note: we prefer you have your complimentary breakfast at the dining table only! There is a medicine chest and if necessary a doctor on call. --	Unbeatable location -	Good all age of travelers -	Good service – what you see is what you get. -	We speak and understand Hindi, Bengali and English 2 rooms separated. Each has a private entry - Room 1(AVARANI) – Large double antique bed, a private sitting area, Air-conditioned, steel Almira and locker. - Room 2 (SHYAM SUNDAR) – single bed with a private desk and closet with lock - Separate attached baths for each room with hot and cool showers - TVs in each room - Each room is airy and has a private entrance -- WiFi-enabled apartment - 24/7 security personnel at the main entrance - Day and night security camera outside our door - You'll also get a key for your room and cupboards The entire house is furnished with antique and classic furniture, paintings and artifacts. All rooms are immaculately clean, with fresh bed sheets, flowers, mosquito repellents and nets, fresh drinking water from the kitchen purifier. - 2 rooms separated. Each has a private entry - Room 1 – Large double antique bed, a private sitting area, Air-conditioned, steel Almira and locker. - Room 2 – single bed with a private desk and closet with lock - Separate attached baths for each room with hot and cool showers - TVs in each room - Electric Kettle n each room - Each room is airy and has a private entrance -- WiFi-enabled apartment - 24/7 security personnel at the main entrance - Day and night security camera outside our door - You'll also get a key for your room and cupboards The entire house is furnished with antique and classic furniture, paintings and artifacts. All rooms are immaculately clean, with fresh bed sheets, flowers, mosquito repellents and nets, fresh drinking water from the kitchen purifier.